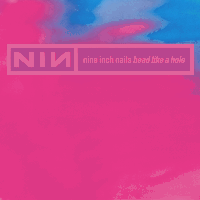 Difference between revisions of "Head Like A Hole (halo)"
Head Like A Hole (also known as Halo 3) is the second single by Nine Inch Nails, and the second single from debut album Pretty Hate Machine, released on March 22, 1990 by TVT Records. The single was released in maxi-single (US) and standard single (UK) formats and do not contain the original album version but rather several remixes of the title track. 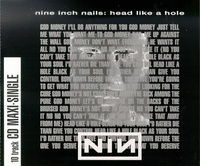 Remixes of "Terrible Lie" are the B-Sides for this single, as well as the two remixes of "Down In It" that appeared on the Down In It single and a demo that only appears on the Head Like A Hole single itself. The US Maxi version is actually longer in duration than Pretty Hate Machine while the UK Single is standard size. On the UK version, there is an (Opal) mix which doesn't appear on the US version. Also the first track, the (Clay) mix which was used for the "Head Like A Hole" video is mislabeled as the (Slate) mix which is the first track on the US maxi-single but doesn't appear on the UK single version. The maxi-Single's disc art reveals the BPM for "Head Like A Hole" to be 115 BPM and the BPM for "Terrible Lie" to be 88 BPM. On the US version, there's an unlisted 11th track featuring a clip of Kelly Ripa shouting "Let's hear it for Nine Inch Nails! Woooo! They're GOOD!"